In a previous article, I talked about an add-on card for the Raspberry Pi called the ControlBlock. It allows game controllers to be connected as regular joystick devices, but it also has a really incredible power switch feature. The folks at petRockBlog have created an add-on board for the Raspberry Pi that strictly does the power feature for a cheaper price! There are connectors for an LED (either embedded into the switch or separately, like in the photo) that show the progress of the power on/off process. Basically, when switched on, the PowerBlock starts the Raspberry Pi. 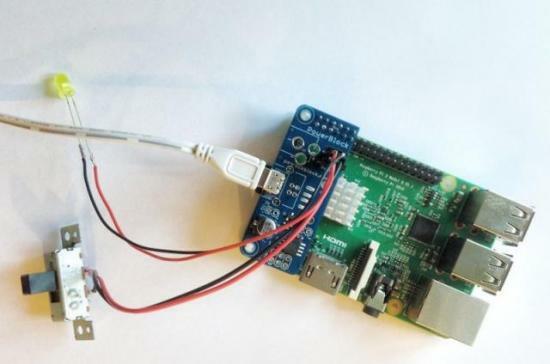 The LED blinks slowly until the RPi is completely booted, then the LED stays lit solidly. When the switch is turned to the off position, the LED blinks rapidly while it goes through the shutdown procedure. Then after the RPi is shut down, it powers off the device and the LED. We love Raspberry Pi projects so much that anything making those projects better deserves attention. The PowerBlock doesn't do anything the more expensive ControlBlock doesn't already do, but if your project doesn't require the game controller support of the ControlBlock, the PowerBlock is perfect.